The positive High Voltage is brought to the anode wires of the straw-tube modules through the HV distribution system. This system distributes the high-voltage bias from the supply units to the HV Boards in the detector Front-End Electronics. An overview of the HV distribution system is shown in the figure below (also available in Autocad format). 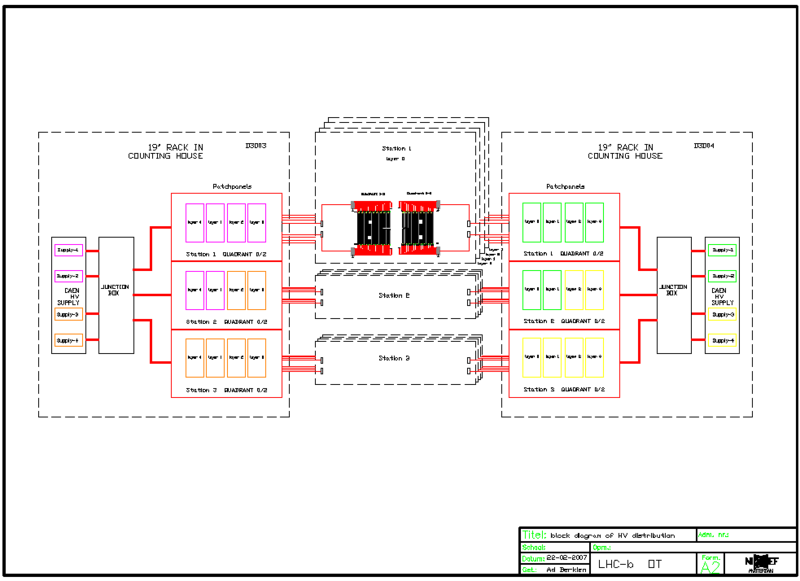 The main feature of the system is that all individual HV inputs of the HV Boards (HVB) in the FE boxes are available on patch panels in D3; however, each HV output channel of the supply units is connected to groups of 8 (eight) HVB inputs.